Snickers were invented in 1930. Frank Mars of the Mars, Inc., candy company invented Snickers chocolate bars in 1930. He named it after one of his favorite horses. Approximately 15 million Snickers bars are made every day. That includes about 100 tons of peanuts. Factory conveyor belts form the zig-zag line patterns on the bottoms of Snickers bars. Snickers sponsored the 1984 Summer Olympics. Snickers bars were the official snack food of the 1984 Summer Olympics held in Los Angeles. As you can see, Snickers bars have been around for a while and have remained popular since they were invented. You know you’ll need Snickers in bulk at Halloween and every other candy-giving holiday. It never hurts to have a supply of Snickers bars around, since you know you and your family will always want more than one. 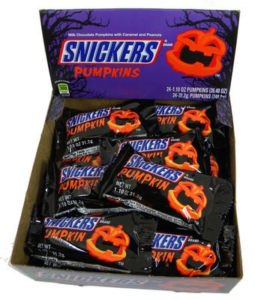 You can order your Halloween Snickers in bulk at BlairCandy.com.